Macon, Georgia is located in the heart of football country and Maconite’s can always be counted on to support their favorite football team. On any given weekend you can find the football faithful gathering together, wearing team colors and ready to cheer their team to victory. We asked you to tell us where are the best places in Macon to catch the game and here are your answers! Wild Wing Cafe is a wing joint sure to please the masses, while it is a chain Wild Wing definitely has fans that are wild about it. A wealth of TVs to watch the game, happy hour and live music all set this restaurant apart. But it's really the wings that have folks raving about wild wing cafe. With over 30 sauces and all the wing configurations you can think of Wild Wing Cafe is a crowd favorite. 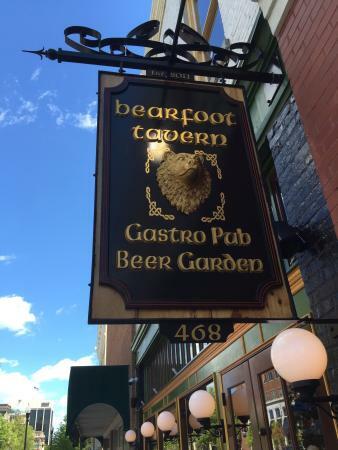 Bearfoot Tavern is a football lover’s dream! From College SEC to the NFL, this is a hotspot for any sports enthusiast. Saturdays are all about college football and the new SEC network, and Sundays are all about the NFL. Friendly staff, great food, an over 50 bottled craft beers make this restaurant a win in your book! Buffalo Wild Wings is a sports fan heaven. Sports junkies can get their fix with over 30 TVs showcasing all your favorite games. The U-shaped bar is crowned by an enormous projection of the Dawgs, Jackets, or Tigers battling it out with this week’s foe. Not a fan of the home team? Sprinkled about the restaurant are TV’s with all the rest of the day’s games. It's hard to beat the combination of big screens, big booths and well you can guest the rest of big reasons to check out Hooter’s for the place to follow your favorite Football team. Hooters has taken care to keep their TV screens up to date and they are carefully positioned to make viewing several games at once a very doable option. Always clean, smoke free and staffed by friendly servers Hooters is worthy pick for the best places to watch a Football game. When it comes to food and drink they have ample choices in both categories and while space can become an issues we suggest arriving early to cop a good seat.